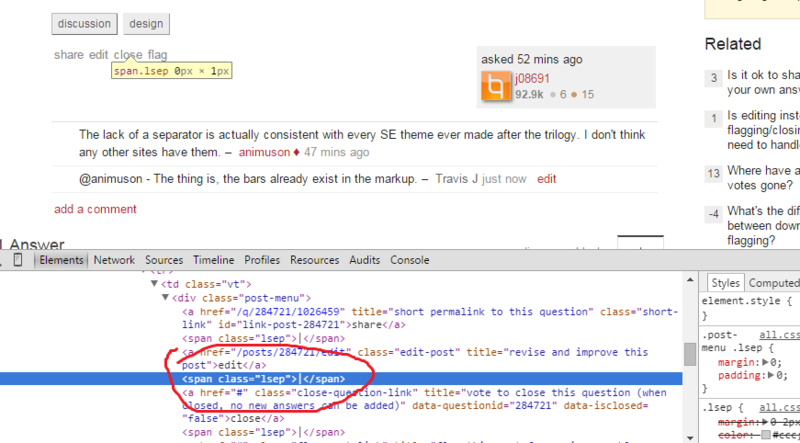 There have been a bunch of discussion topics about the recent SO design change, but one question I haven't seen asked was about a very small detail, the vertical separator between the share/edit/close/flag links that appear below the tags for a question. I wasn't sure if I had imagined the separator, however after a quick Google image search I realized that I wasn't dreaming it up. Any chance of making a very simple, small CSS change and bringing the vertical separators back? Where have all the close votes gone? How to flag dead links? Obvious duplicate still alive, close vote gone — why oh why? What is difference between Approve Edit & Improve Edit?